Come Oscar time, people are going to argue about Captain Phillips nearly as much as they argued about Zero Dark Thirty last year. Pundits will ask: How accurate is the fact-based drama in depicting the 2009 hijacking of the Maersk Alabama and the subsequent hostage ordeal of the cargo ship’s captain, Richard Phillips (Tom Hanks)? Did the filmmakers humanize the hijackers too much, or not enough? Should their depiction of Phillips have been more heroic, or less so? All these arguments will pivot around one truth that’s tough to debate: Captain Phillips is a powerful experience. Director Paul Greengrass has crafted a tightly focused, detailed procedural that grabs the viewer and doesn’t let go. Hanks’ performance is his best in a while, while the young Somali natives playing his captors leave strong impressions, too. More than a film about an Everyman hero (though Phillips certainly qualifies), it’s a film about how a globalized economy can throw people from vastly different walks of life into abrupt proximity — too often with guns in their hands. From the beginning, Greengrass and screenwriter Billy Ray follow two parallel narrative tracks, one starting in Underhill, Vt. (filmed in Massachusetts), and the other in Somalia. 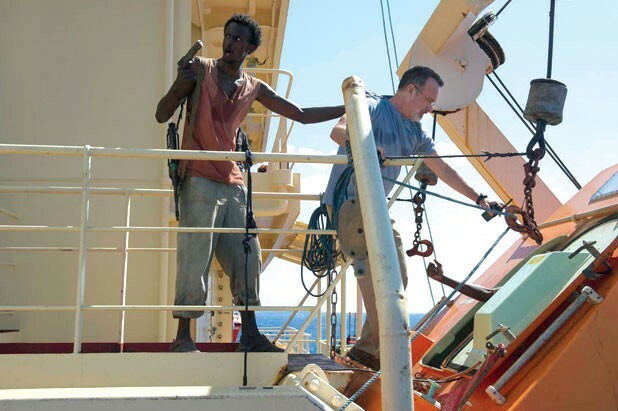 While Phillips says good-bye to his wife (a briefly appearing Catherine Keener), a gaunt young man named Muse (Barkhad Abdi) is getting his orders to head out to sea and take a vulnerable ship for ransom. He chooses his four-man crew the way some guys his age might be choosing a sports team. When the two tracks converge — the pirate skiff speeding toward the Maersk Alabama — we know the results will be ruinous for everyone involved. The first hijacking of a U.S. ship in two centuries is not an endeavor for which these pirates, who can barely agree on what they’re going to do next, are well equipped. But they’re desperate, which makes them dangerous. What’s a hero? Action movies have trained us to expect a square-jawed dude with hard abs who shoots bad guys. Some heroes of that ilk show up toward the end of Captain Phillips — namely, the Navy SEALs who eventually shoot three of the hijackers — but they aren’t its focus. Hanks plays Phillips as an unassuming middle-aged guy like many others — his abs are noticeably not hard — for whom heroism mainly means just doing his job. When his crew urges him to leave pirate-infested waters, Phillips doesn’t, because sticking to the route is what he’s been hired to do. But when his crew is endangered, he puts himself in harm’s way to shield them. For the pirates, as for young men in so many cultures, heroism means something else — risking everything for a shot at the big prize. “The coward is the first one in the grave,” one taunts another. Yet Muse, who speaks English, admits to his captive that the ultimate prize for him would be immigrating to America. “Not Al Qaeda. Just business,” he assures Phillips when he first seizes the ship, letting him know their ultimate priority is the same: Get the job done. In another director’s hands, this script might have come across as didactic, systematically nudging us to remember that everything is connected and pirates are people, too. But Ray’s words play effective counterpoint to Greengrass’ visceral approach, which makes it impossible for us to forget even for a second who’s pointing a gun at whom. Greengrass is a master of pseudo-documentary technique, which he used to re-enact a real-time tragedy in United 93, and then to give a shot of faux-vérité to The Bourne Supremacy and The Bourne Ultimatum. The handheld cameras aren’t as shaky or the cutting as frenetic in Captain Phillips as they were in his action flicks, but Greengrass does keep us right in the action, often in the position of someone following Phillips down the ship’s passages or peering over his shoulder. Accordingly, the violence is up close, real and terrifying. And while our feelings of pity and terror may extend from the crew to the pirates, we never forget who is perpetrating the crime. It’s easy to forget that Abdi and the other Somali actors are actors — first-timers, at that — not just because their performances are natural, but because their faces are unfamiliar. Forgetting that Hanks is a movie star is a lot harder, and it’s a testament to his skill and humility here that he doesn’t grandstand or even overly stand out until his character becomes the focus of the action. We can read Phillips’ thoughts and fears in his eyes, and when his ordeal reaches its inevitable conclusion, Hanks portrays trauma with a rawness that’s tough to watch. I never thought I’d say this after the guffaw-worthy work he did last year in Cloud Atlas, but maybe, just maybe, the guy deserves the fresh round of awards he will undoubtedly get. There’s not much suspense in Captain Phillips, given that we all know how the story ends. Yet Greengrass immerses us so effectively in unrelenting tension that we may find ourselves praying for Phillips’ survival. Never mind the inevitable arguments about the movie’s veracity. It earns our respect as drama by putting us through a wringer from which we emerge shaken and genuinely grateful that the title figure emerged, too.